Urbanites struggle with eating healthy food during the week and go all out with socializing over coffee and dinners over the weekend. They then go to extreme lengths to make up for the unhealthy eating habits, long work hours, and sedentary lifestyle without realizing this too is not healthy nor sustainable. Celebrities tout their cleansing programs, detox diets, and detox juices, and millions take their word as gospel without quite understanding if they really promote help or if they are just hypes and marketing gimmicks. So, the question becomes- are all detox programs beneficial? Is there a right way to detox? There is no real scientific evidence that suggest these diets detox our body. A healthy liver and kidneys do a fine job of detoxifying the body as it is and we need not rely on certain ingredients (lemon, honey, green tea, and herbal teas) to cleanse our system. In fact such diets are known to add a considerable amount of stress and prove to have detrimental effects in the long haul. Detox diets are very low in caloric intake, often include liquids, fruit juices (devoid of any fiber) that end up spiking blood sugar and insulin production owing to the high doses of sugar present it them. With these spikes come dips which leave the dieter feeling low on energy, dizzy, irritable, and moody. Dieters without realizing that the initial weight loss is almost entirely water weight and not fat loss are content and happy to note a sudden dip in weight on the scale. Eventually, the body starts to mobilize protein sources to provide energy causing a loss of muscle rather than fat. Dieters also feel a psychological boost of being in control of their body. Eliminating the salty, processed, sugar food items makes dieters feel less bloated, lighter and they may end up feeling full without really eating much. For a more healthful approach, emphasis should be on detoxing lifestyle choices- such as eating a healthy and balanced breakfast, eating at regular intervals, and reduce dependence on processed foods and high sugar drinks in the long run. To naturally detox one must give a miss to fast food, packaged food products, ready-to-eat meals, sugar-sweetened beverages, refined and processed food and instead focus on freshly cooked meals made from local produce. Nourish the body with natural, unprocessed foods that have a high nutrition quotient and are high in fiber. Soluble fiber (present in oatmeal, lentils, apples, oranges, pears, nuts, flaxseeds, beans, psyllium, cucumbers, celery, and carrots) acts as a sponge, slows down digestion, helps control weight, and reduces cholesterol levels. Insoluble fiber (present in whole wheat, whole grains, barley, couscous, brown rice, broccoli, cabbage, onions, tomatoes, and root vegetable skins) is considered gut-healthy because it has a laxative effect and adds roughage to the diet. There’s a difference between giving the body some respite and giving it complete overhaul. 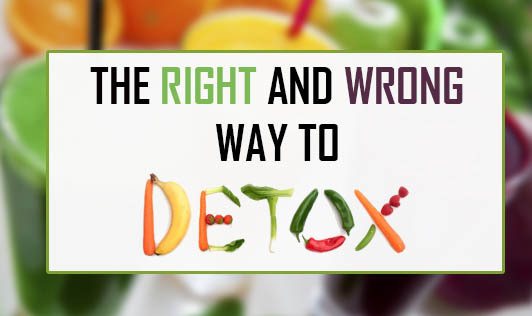 A detox diet won’t clean the body of “toxins” and “poisons” as promised. Truth is- the body does not need external agents to restore internal vitality and wellbeing.